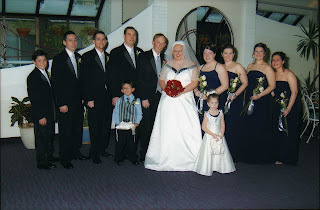 On Friday (February 4th) Huib and I will celebrate our 5th wedding anniversary. It’s hard to believe it was 5 years ago that we said our vows in front of family and friends at the Waterloo Inn and spent the evening celebrating. We’re still paying off the wedding, but it was a memorable day for everyone. Huib and I have decided to mark this anniversary and every tenth one after (15th being our next) by creating a slide show of pictures from our years together. This one will include pictures from our full ten years together, but the ones following will only include pictures from the last slide show up to the current year of the anniversary. If I can figure out how to do it, I will post the slide show here and on Facebook for everyone to view. Being Huib’s wife has been an indescribable experience. He’s one in a million and I’m blessed to have him all to myself. I know I write about how amazing he is all the time, but you really have to know Huib to understand that I’m not exaggerating. He’s extremely caring, overly loyal and wants nothing more than for me to be happy. Whenever we’re out and he sees something I might like he’ll show me and if I even smile, he’ll say we should buy it or tell me we’ll get it when it goes on sale. When at work he e-mails if I haven’t already to see how I’m doing or calls during his breaks just to hear my voice. When his co-workers ask him to come out for a drink after shift or invite him over for a party, he’ll either tell them he has to get home or ask if he can come later with me. I’m not sure people understand our relationship at times, but from day one Huib and I have always tried to include one another in everything – not because we have to, but because we want to. I love you Huib with all my heart and could never imagine life without you by my side. We’ve made it this far, let’s try for a lifetime! !